Properly-located landings, access roads, and skid trails are essential components of safe and productive forest harvesting operations, but they also represent the most common sources of sediment to streams. Brown and Visser (2017) found that 73% of sediment breakthroughs to stream channels were associated with concentrated runoff from roads, skid trails, stream crossing approaches, and ruts from machine tracks on hillslopes directed toward streams. This emphasizes the importance of minimizing earthworks, locating roads and stream crossings to avoid steep gradients, maintaining a buffer between disturbed soil and streams, and prescribing site-specific best management practices (BMPs) for surface cover and water control. Steep slopes, erodible soils, and the site-specific requirements of harvest plans often mean that we cannot meet each of the aforementioned objectives. However, when it comes to controlling surface erosion, focusing on reducing runoff volume and velocity and providing adequate surface cover is critical. Roads located to avoid steep gradients can facilitate the control of runoff velocity. Water control structures (e.g., water bars, cross-drain culverts, and turnouts) spaced according to road gradient and soil erodibility, as well as the shape of the road template, can reduce runoff velocity and volume. 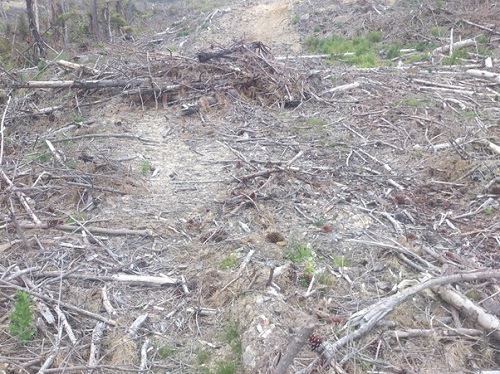 Haul roads surfaced with aggregate and skid trails that are closed with slash or straw mulch (Figure 1) can be used to provide the cover needed for erosion control. Furthermore, adequate water control and surface cover is especially important at road-stream crossings, as these erosion sources can have a direct pathway to the stream, if not carefully managed. Logging slash used during site closure to provide surface cover on a skid trail approach to a stream crossing. Also note that a slash barrier is used to disrupt concentrated surface runoff to the stream. While we cannot expect to eliminate surface erosion and sediment delivery, the quantity of sediment that reaches streams can be managed through road location planning and provisioning of streamside management zones (SMZs). Examples include locating roads and trails away from stream channels (Figure 2) and minimising stream crossings. Generally, concentrated runoff that must travel longer distances over well-covered and rough surfaces (e.g., the cutover or a native forest buffer) will deposit more sediment before reaching stream channel networks. Well-planned and constructed skid trails that stay on the ridgetops and out of stream channels. Brown, K.R. and Visser, R. 2017. 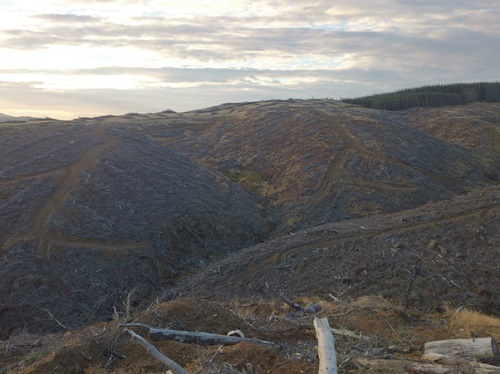 Erosion sources and sediment pathways to streams associated with forest harvesting activities in New Zealand. Proceedings of the 19th Biennial Southern Silvicultural Research Conference. March 14-16, 2017. Blacksburg, Virginia, USA. In review for publication as a U.S. Forest Service General Technical Report, Southern Research Station.